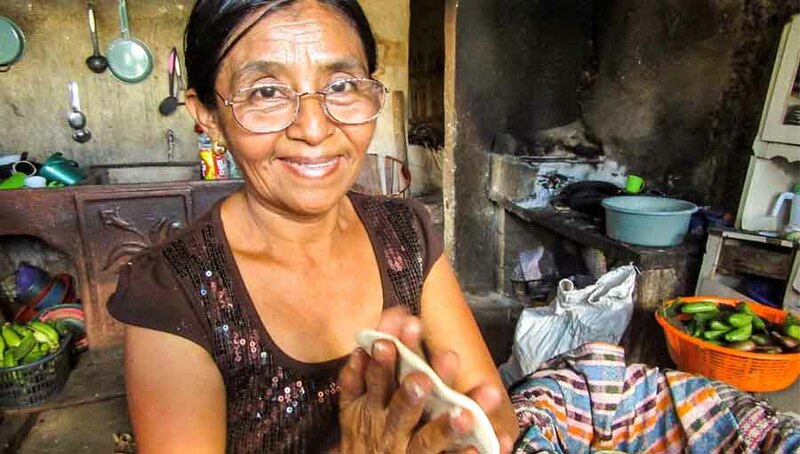 The IAPB-Rotary International Service Partnership aims to join IAPB member agencies with Rotary Clubs around the world to jointly design, fund and implement eye care projects around the world. IAPB and Rotary International (RI) signed an MOU in 2017 making the IAPB-RI partnership one of only five service partnerships in RI’s portfolio. On behalf of IAPB, the International Eye Foundation (IEF) established the first pilot project to demonstrate this service partnership. Rotarian Thomas Kwako in the US introduced IEF to Rotarian Manjit Sawhney at the Rotary Club of Delhi South Metropolitan. We then set about developing a joint project at Karol Bagh which is a highly industrial and a densely populated section of old Delhi near the iconic Connaught Place. The shops are small enterprises, often family owned, which front the narrow streets. Behind the shops, the blocks are packed with small residential apartments. For most patients, private ophthalmology practices are prohibitively expensive and government facilities have long waiting lists. 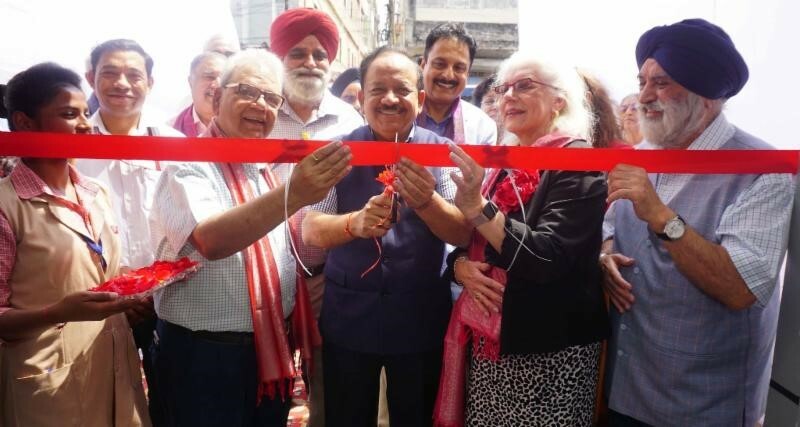 A philanthropist had donated land and a building in the heart of Karol Bagh which was perfect for a small eye hospital. 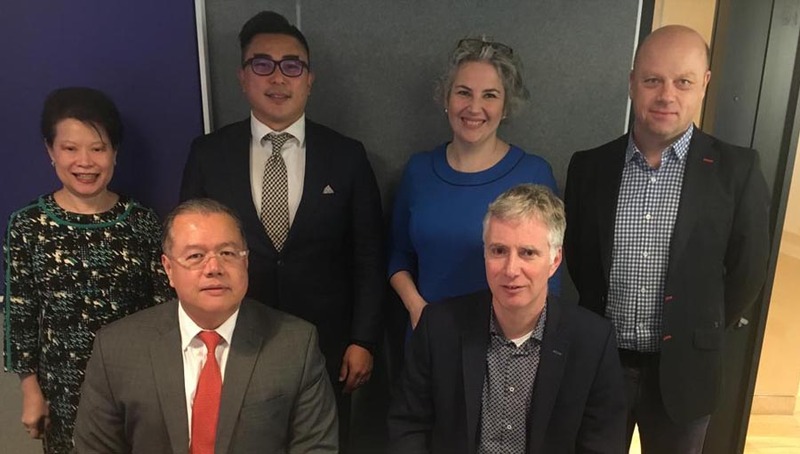 IEF’s Director of Sustainability Initiatives Raheem Rahmathullah and Rotarian Sawhney and his Rotary team which included architects set about designing the build-out, staffing, equipment, and business plan for the new centre. Just 11 feet wide, the building goes far back and has four floors including a small operating theatre and optical shop. The new centre brings eye care and surgery right into this teeming community. The service partnership asks that the IAPB member and the Rotary Club match funding for the project. 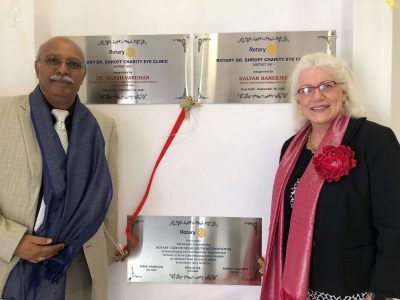 The Rotary Club of Delhi Metropolitan South in collaboration with clubs in Korea and Hawaii raised funds that were matched with a Rotary Global Grant totaling $200,000 and IEF put in $200,000. IEF planned to organize the new centre as a social enterprise following IEF’s sustainability model that is self-sufficient while also serving the poor. The plan was to collaborate with the Dr. Shroff Charity Eye Hospital, an IAPB member founded in Delhi in 1914, for staff training. Halfway through the project, Shroff’s Director Dr. Arun Arora, and Medical Director Dr. Umang Mathur agreed to bring the new centre into its network as a satellite hospital. 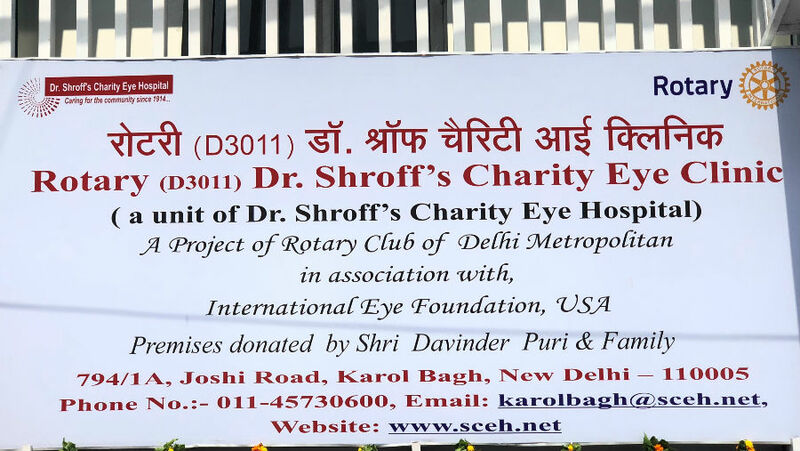 The newly named Rotary Shroff Eye Centre at Karol Bagh is now staffed and supervised by Shroff ensuring quality care and sustainability for the future, a great example of serendipity. The new hospital follows Shroff’s system whereby 50% of patients are paying and 50% are treated free of charge. Additionally, Shroff’s current satellite hospitals typically do not include an operating theatre and this is now being considered by Shroff going forward because this model will reduce the burden on Shroff’s surgical services at its main campus which is now at full capacity. The Centre opened to patients on 21 May, but the official opening was held on 18 September in the presence of the Minister of Health, Rotarian Manjit Sawhney, Rotary District Governors and leaders, Dr. Arun Arora and Dr. Umang Mathur of the Dr. Shroff Charity Eye Hospital, Mr. Puri who donated the land and building, and Victoria Sheffield and Raheem Rahmathullah of IEF. We were honored to have with us Dr. Cyrus Shroff, ophthalmologist and grandson of the founder of the Dr. Shroff Charity Eye Hospital. 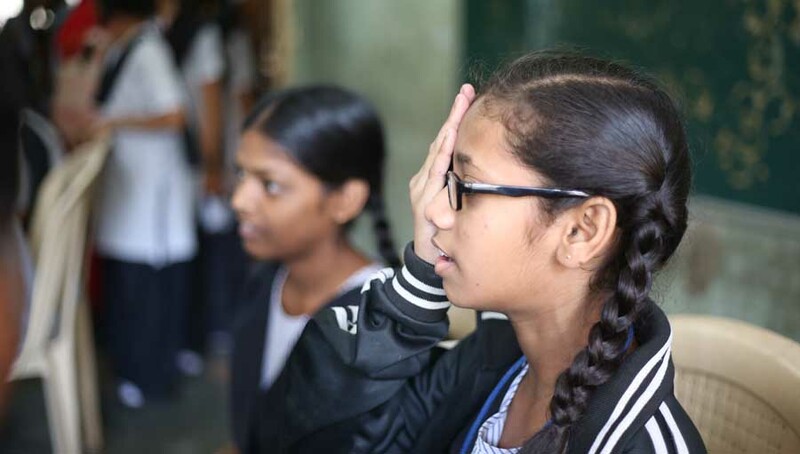 The Rotary Shroff Eye Centre is a sustainable social enterprise serving all eye patients including the poor that brings eye care closer to the people in its surrounding community. 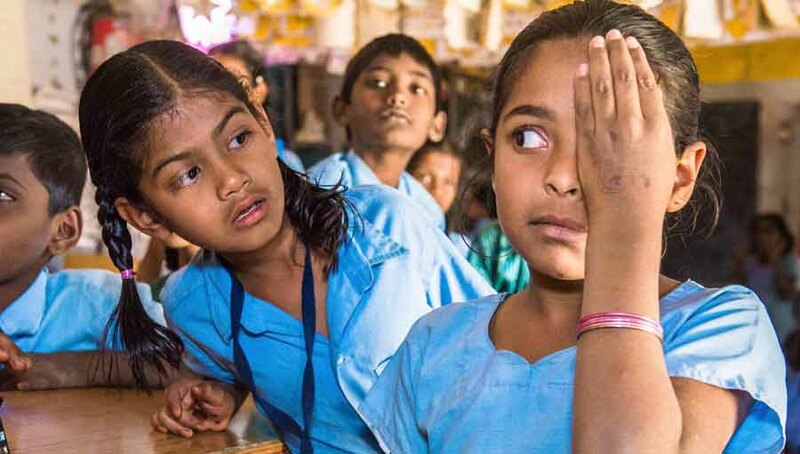 What began as a partnership between an IAPB member and a Rotary Club grew to include other Rotary Clubs and another IAPB member demonstrating that projects can be a mix of like-minded IAPB members and Rotary Clubs dedicated to improving eye health and preventing blindness. We hope that more partnerships are developed to expand our resources toward improving eye care worldwide.